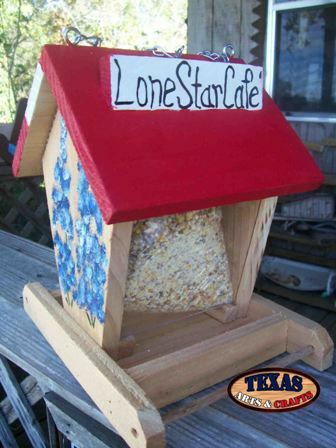 We hand make a bird feeder called the Lone Star Cafe in our workshop out of cedar. The roof of the bird feeder is hinged to make it easy to add bird seed. The Texas state flag is painted onto one side of the roof and the other side is painted red. The size and colors may vary slightly as it is hand made. Some of the birds that will be attracted to the bird feeder are the American Kestrel, the Great Crested Flycatcher, Wrens, Chickadees, Nuthatches,Titmice, Swallows, Blue birds, Purple Martin, Mockingbirds, and Woodpeckers. For more information about these birds go to Backyard Birds, Blue Birds, and Purple Martin Birds. The bird feeder is 9 inches tall by 9 inches wide by 7.50 inches deep. The bird feeder weighs approximately 3 pounds with packaging. For the continental U.S. shipping and handling is included in the listed price. For shipping outside the continental U.S. please contact us through our Contact Us page. 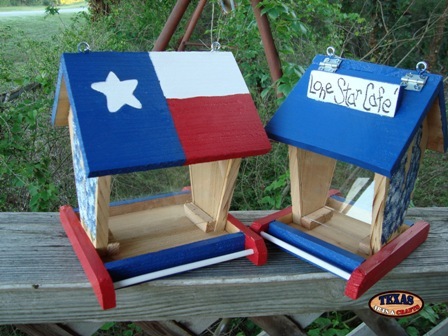 We hand make a bird feeder called the Texas Lone Star Cafe in our workshop out of cedar. The roof of the bird feeder is hinged to make it easy to add bird seed. 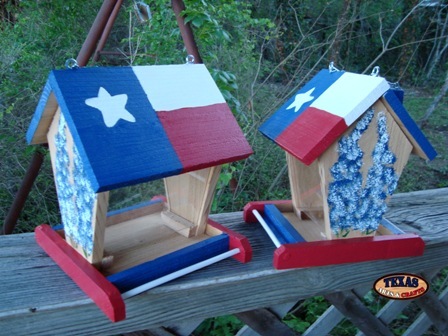 The Texas state flag is hand painted onto one side of the roof and the other side is painted blue. 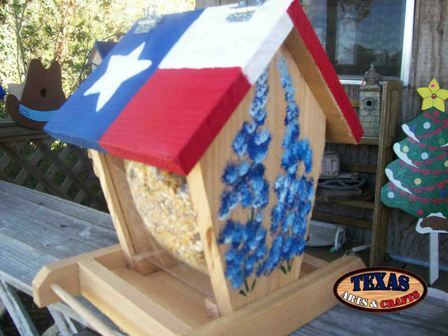 Bluebonnets are painted onto the sides of the bird feeder. The size and colors may vary slightly as it is hand made. Some of the birds that will be attracted to the bird feeder are the American Kestrel, the Great Crested Flycatcher, Wrens, Chickadees, Nuthatches,Titmice, Swallows, Blue birds, Purple Martin, Mockingbirds, and Woodpeckers. For more information about these birds go to Backyard Birds, Blue Birds, and Purple Martin Birds.